Enhanced external counter pulsation (EECP) is a noninvasive treatment which can increase arterial blood flow to several major organs such as brain, heart, liver and kidney. How does EECP treatment work? 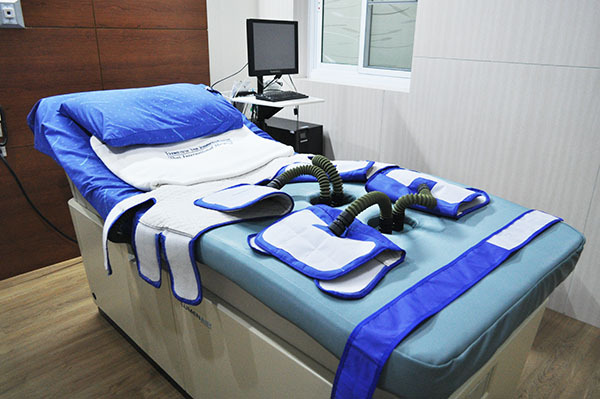 EECP consists of three leg cuffs which inflate and stimulate your blood from both legs turn back to the heart. The inflation-deflation of the cuff is determined by your heart rhythm. The machine has computer that continuously detects your heart rhythm (by continuous ECG monitoring) and also blood pressure change on your finger (by finger plethysmography). By this mean, the pressure within aorta (great artery that arise from the heart) will increase during the period of heart muscle relaxation or ventricular diastole which contributes about 80% of overall blood supply to heart muscle. Within 1 week after completion of the last EECP session, a reevaluation of the patients (determination of the quality of erection, duplex sonography after intracavernosal PGE application) was performed.